Our first priority should always be to work safely. Safety is the first tenet of the KANE Code and something I take personally and seriously. It is critical that each of us considers the environment around us and strives to improve the safety of each KANE associate. In our 2015 mission, one of our goals is keep safety first. Our plan is to achieve an RIR (recordable incident rate) at every location and DC of 2.1 or less. Through July 2015, our score as a collective company is 2.0. That is a terrific result, but we must strive to keep the focus on safety. I don’t wish to understate what we have accomplished, but the goal is zero injuries. Period. 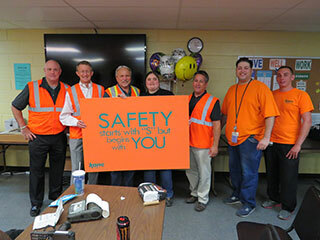 Our safety department held a slogan contest from June 1st to June 30th asking all of you for your creative ideas. We had a great response with over 200 entries. The goal of the contest was to get ideas on how we can place safety at the forefront of everything we do. We plan to post the winning slogan in high traffic locations such as by the time clocks and break rooms. Safety should be top of mind for associates when you arrive at work and the last thing you see leaving as they travel home to your family and loved ones. The 200 entries were submitted to the corporate safety committee and the top 10 safety slogans were selected. These 10 finalists were then sent to the senior leadership team to decide on the winning entry. I’m happy to announce that Lindsay Coolbaugh’s entry was chosen. Lindsay is a verifier at DC6 CaseStack and an associate since August 2013. Lindsay’s slogan is Safety Starts with "S", but begins with "You". Please join me in congratulating Lindsay. I’m thrilled that the contest was well received and many of you took the time to participate. Our collective team dedication to the goals of keeping safety first, treating customers like family, sweating the details, avoiding surprises, and honoring our word will deliver our promise of dependable people, exceptional logistics. Thank you and keep working safely.